Thomas Hart was born at Caulfield, Victoria. He studied at the University of Melbourne, graduating with a B.A. (1890) and M.A. (1892). While at University Thomas Hart a scholarship in final honours in mathematics and natural philosophy, and the much coveted Wyselaskie scholarship in mathematics. In July 1896 Hart was appointed lecturer in geology, mineralogy, mining and botany, as well as curator of the museum, at the Ballarat School of Mines (SMB). In June 1896 the SMB Council resolved to offer Thomas Hart 2 pounds two shillings a week for forty weeks in the year for teaching photography. 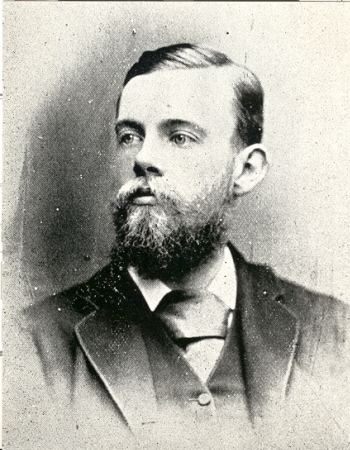 Thomas Hart was appointed a Professor at SMB in 1908. In May 1913 Thomas Hart was appointed first senior master of the Creswick School of Forestry. He joined the Education Department and became a member of the foundation staff of Footscray Technical School in 1916. The next year he took an appointment at the Bairnsdale School of Mines where he taught mathematical, geological, and botanical subjects. In 1931 he transferred to Brighton Technical School and later that year to the Correspondence School in Melbourne from which he retired in 1936. He wrote widely of Victorian natural history. In 1887 Thomas Hart joined the Field Naturalists' Club of Victoria and in 1894 the Royal Society of Victoria. He was elected a fellow of the Geological Society of London in 1901. He attended the congresses of the Australasian and British Associations for the advancement of science when held in Melbourne. Thomas Hart contributed over fifty papers to the Victorian Naturalist between 1892 and 1954 and ten to the Proceedings of the Royal Society of Victoria between 1899 and 1913, most of them descriptive accounts of botanical and geological features in Victoria. Hart became well known among Australian naturalists for his wide knowledge of Victorian plants about which he carried on a vigorous correspondence with both expert and novice. An orchid which he discovered near Bairnsdale in 1925 was named Prasophyllum Hartii by R. S. Rogers in his honour. He was a foundation and long-serving member of the committee of management for the Lakes National Park at Sperm Whale Head and a member of the Victorian Plant Names Committee of the Field Naturalists' Club. 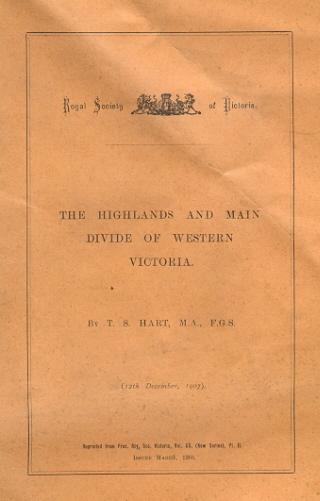 Image caption (LHS): Cover of Thomas Hart's booklet 'The Highlands and Main Divide of Western Victoria', 1907.